Learning from history or just learning history? Tory Historian found an interesting posting on an extremely good American blog. Can we learn from history, asks Neo-neocon and gives a rather depressed answer. There is quite an interesting discussion about it. For Tory Historian this is the wrong question. First we must learn history and learn it in some detail. (Yes, yes, those dates are still uncollected. Mea culpa, mea maxima culpa.) Only then can we think of learning from it. Otherwise, even if people do think that they have learnt from history, the chances are that it is the wrong lessons they have drawn. Tory Historian has written admiringly of George Orwell before (here and here), despite expressing a certain amount of disagreement with some of his pronouncements and writings. But there is nothing more annoying than watching people reduce this hard-headed and strong-minded writer to mush. The guilty party in this case is the National Film Theatre, an institution Tory Historian is very ambivalent about. It shows many good films from the past and that is good; it also provides notes of unsurpassed silliness that are examples of soggy-left and thoughtless political consensus. Tory Historian has lost track of the number of times some American producer, director or actor who had a highly successful career in Britain, on the Continent or, even, back in the United States has been described as being a blameless, liberal victim of “McCarthyite witch hunts”, with complete disregard of the difference between the Senate enquiry that was not in the slightest interested in Hollywood and the House Un-American Activity Committee (HUAC) and equally complete disregard of the fact that most of those “innocent” victims were, in fact, Communists who had preferred to lie on orders from the Party. 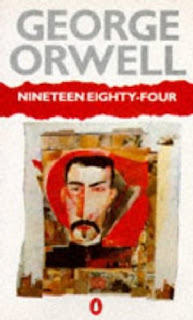 In April the NFT will be marking the 60th anniversary of the publication of “1984” with films about Orwell, as well as a showing of the famous 1956 version with Edmond O’Brien, the less well-known 1954 TV play with Peter Cushing and the 1984 film with John Hurt. 2009 marks the 60th anniversary of the publication of George Orwell’s classic dystopian vision of Britain. In Orwell’s re-imagining of British life in the year 1984 the nation has become Airstrip One, a subsidiary of Oceania, one of three global superstates engaged in relentless warfare against one another. London is a fetid, near-derelict metropolis dominated by the monolithic buildings of the ruling Party, its slums battered by rockets fired from enemy states. The collective memory of life before the wars has been all but obliterated by the Party which shapes and monitors the lives of its workers while keeping the disorderly ‘proles’ in a state of controlled ignorance. Dystopian vision? Re-imagining of British life? Is there not a word missing here, one beginning with the letter “c”? Orwell was not writing a dystopian vision and, while he was re-imagining life in Britain, he was describing a very precise society. The shortages, the denunciations, the Inner and Outer Party, the re-writing of history and throwing articles about unpersons into the memory hole, the biographies of imaginary shock workers and, above all, the permanent enemy Emmanuel Goldstein, obviously the figure of Trotsky – these are all aspects of Soviet society, of Communism. Clearly, as far as the NFT and its meandering, never-stepping-out-of-the-box programme organizers, Communism is just one of those unpleasant episodes that have to be thrown down the memory hole. Otherwise the left-wing vision of the world might be polluted. "The last truly utopian planning project in London"
Tory Historian went to the Barbican today (on the Circle Line from Westminster and it did not take all that long – what is the world coming to) but found that the Le Corbusier exhibition, much discussed in the media, does not actually open till tomorrow. Bad planning and an unusual misreading of the programme. Never rely on media write-ups, is a good motto and Tory Historian should have remembered it. The last truly utopian planning project in London and greatly inspired by his [Le Corbusier’s] aesthetic, the Barbican presents the perfect backdrop to discover the man and his legacy. That is the precise sentence as printed; therefore Tory Historian takes no responsibility for the shoddy grammatical structure. The content is of interest, though. Le Corbusier is probably one of the evil geniuses of the twentieth century, a man with whose legacy we are still contending. His notion that people’s lives can be wrenched out of their accepted grooves, arranged and organized according to some grand plan devised by those who know best fitted in well with many other, more political than cultural views of the time. The appropriateness of the Barbican, one of London’s ugliest structures, hosting the exhibition had already occurred to Tory Historian. It is, however, interesting that this monstrous, unattractive in any weather and shambolic building should be described as “the last utopian planning project in London”. Want to know what a twentieth century utopia was intended to be once all those who opposed it had been carted off to the concentration camps? Well, go to the Barbican and try to navigate your way round it, not forgetting the unattractive eating places and the incomprehensible lifts. Then look across the water at St Giles Cripplegate, a mediaeval church, much rebuilt and enlarged through the centuries with which Milton, Cromwell, Frobisher and, even Bunyan were connected. It survived the Great Fire but was gutted by German bombs in 1940. The outside survived even the Blitz and was restored using the plans of the reconstruction of 1545, after another fire. Utopia loses to history. Long may that continue. Tory Historian rather enjoys reading newspapers of many decades ago but finds the exercise a little depressing, comparisons with the present day not being of the happiest. For reasons too difficult to explain, Tory Historian was reading letters in The Times of March 1939 on the subject of conscription, then much discussed as the Bill was going through Parliament. The letters columns had various arguments for and against, one of the most vociferous and long-winded being the great military historian and theorist, Captain Basil Liddell Hart (later Sir Basil) who was a fervent opponent of the whole idea. His arguments were two-fold. Firstly, he thought it was impractical. Soldiers, he reasoned, accurately enough, needed to be trained. Numbers were not enough, one needed equipment and, above all, qualified instructors, who had to understand military technique and be able to expound it well. Absent these, the recruitment of large numbers and, especially, conscription of even larger ones, made things considerably worse. Many would argue that the early campaigning by the British Expeditionary Force proved Liddell Hart’s point, up to and including Dunkirk. His second argument was based on a simple idea: conscription was alien to a democratic society. There were those who produced counter-arguments, citing other democracies that had conscription. One letter referred to France and the Scandinavian countries adding that these were “countries in every sense more democratic than our own”. I hope the writer meant the Scandinavian ones for France, where women did not get the vote till well after the Second World War, can hardly be called a superior democracy in 1939. Looking back on its army’s collapse within a year of that debate one would be justified in doubting the efficacy of conscription. Liddell Hart would have none of it. Whatever the case for compulsory service in an earlier generation, when other democratic nations adopted it, it is inevitably affected now by the fact that we are threatened by nations who have made it not merely a means but and end – a principle of life. The Totalitarian State is the total-compulsion State, to which the individual is enslaved. For us to adopt compulsory service under pressure of their challenge would be a definite surrender of our own vital principles – and admission of spiritual defeat. These are words that, mutatis mutandis, need to be pondered over today. They also tie in quite interestingly with the thesis propounded by Jonah Goldberg in “Liberal Fascism”, where he points repeatedly to the fondness evinced by “liberal” or left-wing leaders, politicians, governments for using the idea of a war and compulsory service in non-military situations in order to build up an orderly and obedient society. Tory Historian recalls this day in 1975 when a major political party elected its first woman leader who went on to become a spectacular (if flawed, naturally enough) Prime Minister. After years of media speculation as to whether Shirley Williams or Barbara Castle were likely to become the first in the woman leadership stakes, it was, inevitably, the genuinely innovative party, as it has been in history, that got there first. About five years ago Tory Historian happened to be in the lobby of the House of Lords (known as Peers’ Lobby for obvious reasons). Baroness Thatcher walked across the floor and every single head turned to follow her progress. This was not because she is particularly unsteady or because she is gaga (despite all the malicious gossip that swirls round the internet) but because, with the best will in the world nobody can think of anyone in modern politics who can rival her in personality. Today's anniversary is particularly intriguing. On February 10, 1354 students at Oxford University fought a pitched battle with the townspeople of that fair city. Town and gown, you see, which according to the official account necessitated the creation of some primitive halls of residence that eventually became the first three colleges: University, Merton (the first college with a quad) and Balliol. Some students fled from Oxford and founded a new university on the river Cam, where the pattern was similar - riots and running battles with townsmen, need for royal protection and for some rules being imposed. Here is a well-written and entertaining, not to say ferocious account of the St Scholastica Day battle by Mark Edelman Boren, which also gives the date as 1354. This seems to be disputed by other sources, who prefer 1355. Students, eh? Don't know which year they are in. Wikipedia explains that the townsfolk won the battle if for no other reason than the fact that they killed more students than lost their own people. However, it would appear that the Chancellor got to the King first and the University was declared the winner. The dispute was eventually settled in favour of the university when a special charter was created. Annually thereafter, on February 10, the town mayor and councillors had to march bareheaded through the streets and pay to the university a fine of one penny for every scholar killed, a total of 5 s 3 d. The penance ended 470 years later, in 1825 when the mayor of the time refused to take part. On wonders why previous mayors had not thought of such a simple solution. Tory Historian feels that Susanna Gregory's mediaeval detective novel that centres on the St Scholastica Day riot will have to be read.